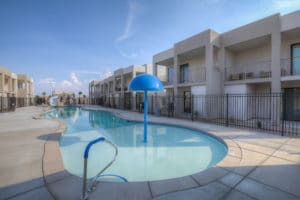 Come make ‘Lifetime Memories’ at the newest and nicest resort in Southern Utah – The Lofts at Green Valley. The Lofts were just completed in August of 2018. Be one of first to stay in the newest St. George luxury complex right next to the Las Palmas Resort. Brand new and luxurious. 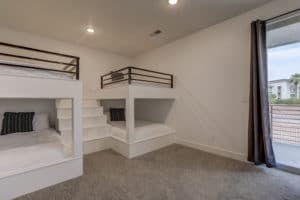 People are raving about the upstairs den featuring 2 built-in full over full bunk beds (sleep 8 in one room). Literally 10 steps out the back patios is a huge pool with a kids water dome, a slide, 2 hot tubs, and a waterfall. Use the bbq and enjoy 5 Roku Smart TVs with 100 plus channels and easy access to your favorite entertainment including Netflix, Amazon Prime Video, HBO and more. 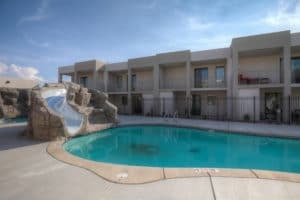 Huge pool and hot tubs are heated very comfortably all year round. Swim in the newest and very large pool all year! 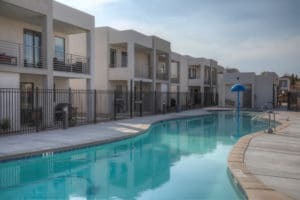 All Lofts are two level, 4 bed/3.5 bath and sleep 14. Bed Configuration: Master (downstairs)- king, Master (upstairs) – king, Guest – king, and Den – 2 bunk beds (4 fulls). Entry is bottom level. 2000 sq feet. 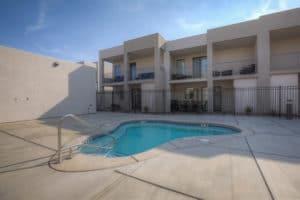 Enjoy one large patio with a view of the pool area and 3 small patios. 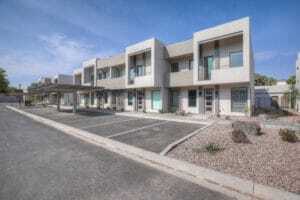 Book quickly, these Townhouses are going fast. Enter your dates above to check availability and to book.